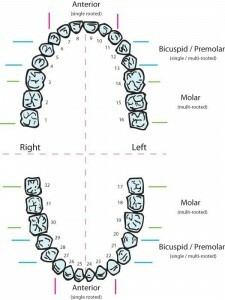 All of our teeth have individual numbers so that the dentists can specify the location of the tooth in the dentition. This entry was posted in Supernumerary Teeth, Supernumerary Teeth Facts, Treatment of Supernumerary Teeth on August 16, 2012 by admin. 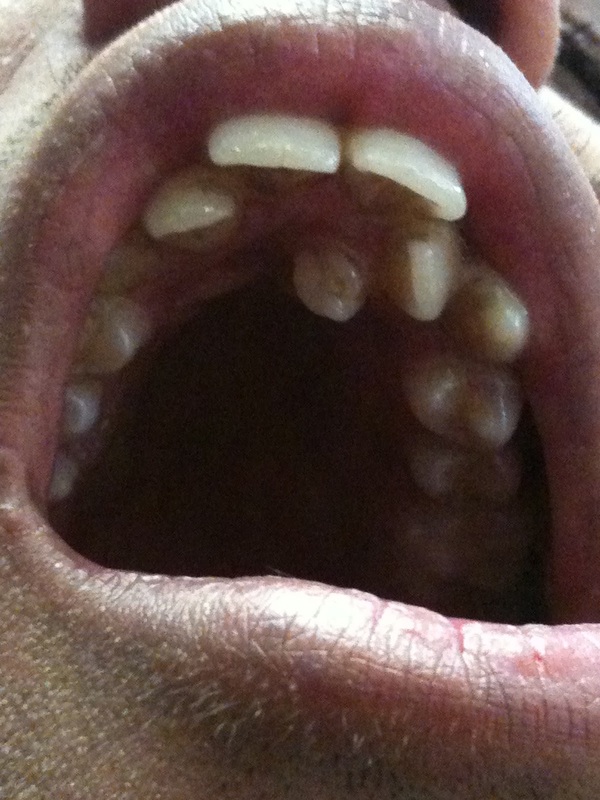 Microdontia is the condition when one tooth, group of teeth or all of the teeth have unusually smaller size. Dens invaginatus is also known as dens in dente. 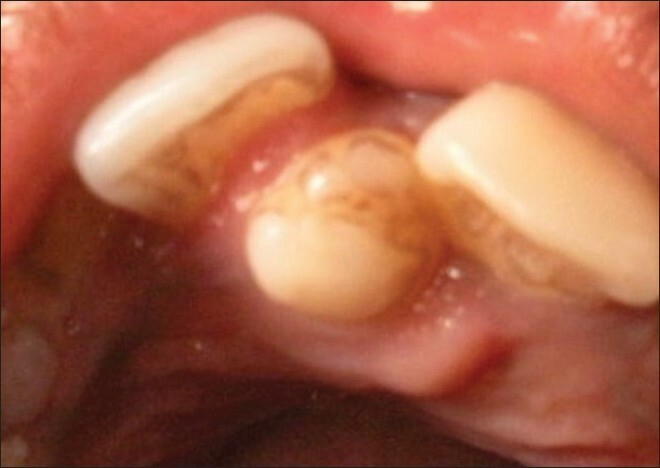 This condition appears when the enamel epithelium invaginates into the dental papilla. 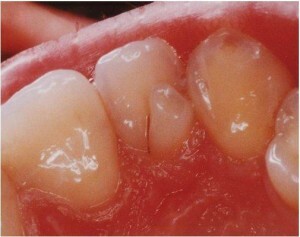 This leads to the invagination in the tooth crown. Sometimes this invagination can extend in the root of the tooth. On the x-rays this abnormality can be seen as a enamel line in the crown or the root of the tooth. Other names for dens in dente are gestant composite odontome and dilated composite odontome (they are rarely used). The most commonly affected tooth is the maxillary lateral incisor. Clinically the dentist can spot a lateral incisor with a deep cingulum pit on the palatal side of the tooth. In the extreme version of dens in dente the tooth root and crown may have abnormal shape. For example it can be spotted as a tuberculate tooth with invaginations on the cusp of the tooth. The pulp is displaced and the enamel line is very thin surrounding the pulp. In some cases the enamel line is even missing. This invagination can change the shape of the root. It is easy to differentiate dense in dente if you have taken x-rays of the abnormal tooth. Dense in dente is more common in males than in females. This ratio varies in different groups but we can summarize it to 2:1. Dens invaginatus differs in racial groups – the Chinese ethnicity is more commonly affected. The presence of one invaginated tooth is a reason for the dentist to take a look at the other surrounding teeth with the idea of having additional abnormalities. Dens in dente can cause dental caries due to its abnormal shape (which is the reason for more plaque retention) and poor mineralization. Dens in dente can be spotted in a single tooth but very often there is an abnormality in the contralateral and adjacent teeth. An experienced dentist should take this fact under consideration. At the x-rays he can spot a incomplete root formation and periapical artefacts. When a dens in dente is diagnosed it is very common for the patient to have supernumerary teeth as well. Some of the supernumerary teeth have abnormal shape (conical, tuberculate e.t.c.) but that doesn’t mean that they are invaginated teeth. If a dens invaginatus is diagnosed at an early stage it can be covered with sealant in order to protect the deep fissures. They are a retention factor for plaque and cariogenic bacteria. Antibiotic therapy has to be prescribed if a cellulitis is at present. Other inflammatory conditions call for drainage and incision (i.e abscess). If there is a periapical changes an endodontic treatment should be executed. If the tooth apex is not formed yet the endodontic treatment should be executed after the apex fixation (using calcium hydroxide root filling materials). Extra teeth also known as supernumerary teeth occur in 0.2 – 0.8% of Caucasians in the primary dentition and 1.5 – 3% in the permanent teeth. The presence of supernumerary is twice more often in males than in females. Usually this condition is hereditary. If the parents have extra teeth there is a 30-50% chance for the child to have supernumerary as well. In most of the cases the supernumerary tooth is located in the anterior maxilla, in the midline or adjacent to the midline. This condition is known as mesiodens. 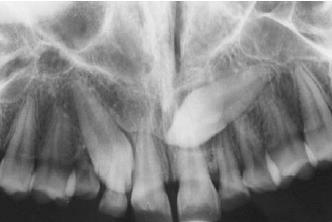 Basically the mesiodens is a supernumerary tooth but because of its specific location it has a different name. When such is found in the midline in the anterior mandibular section it is not called mesiodens. The mesiodens has a specific location and typical shape, often reduced and described as conical or tuberculate. 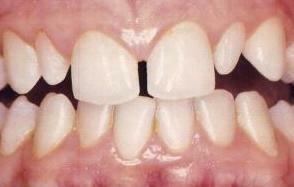 When the extra teeth are located in the posterior regions they are known as paramolars and distomolars. 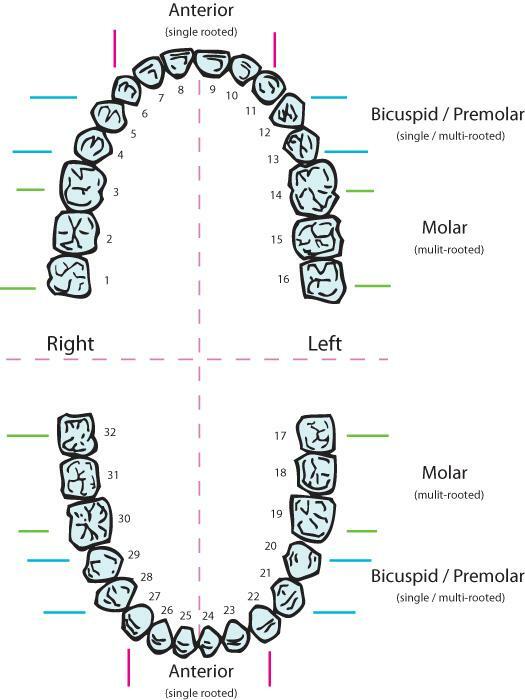 The paramolars are when then supernumerary is adjacent to the normal tooth in the dentition and the distomolars are the extra teeth that have a distal position compared to the normal sequence of the teeth. What is the male:female ratio in supernumerary teeth and mesiodens? They may be present symmetrically or bilaterally. One of the problems then can cause is the delayed eruption of the permanent tooth that are developing under it in the jaw. That condition is normally presented in the case of mesiodens. Diseases in which mesiodens and supernumerary teeth occur. 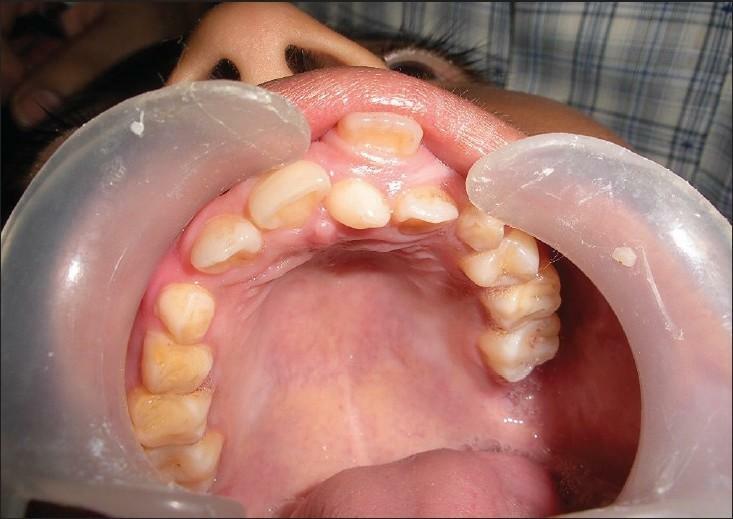 Supernumerary teeth are presented in a number of syndromes and disorders – Cleidocranial dysplasia (Cleidocranial dysostosis), Oral-facial-digital syndrome Type 1 and Gardner syndrome. The presence of malocclusion should be taken for consideration. The orthodontic problems can be a consequence of a supernumerary teeth that delay the eruption of the permanent teeth and cause tooth crowding. A single panoramic radiograph of the dentition gives us the information about the presence or sometimes the absence of teeth (hypodontia). Before the treatment of supernumerary teeth there are some procedures that we have to remember. When we plan the orthodontic treatment we need a good quality study models, radiographs (a single panoramic radiograph is enough), and full face and profile photographs. The pictures are very important for the dentist because after the treatment the patient cannot remember his initial outlook. With the full face and profile photographs the dentist should make a before-after picture that objectively shows the change not only in the teeth but in the soft tissues profile and the lips morphology. This entry was posted in Supernumerary Teeth, Supernumerary Teeth Facts, Treatment of Supernumerary Teeth on August 8, 2012 by admin. Sometimes some of the permanent teeth remain impacted in the bone, resulting in a delay of their eruption. 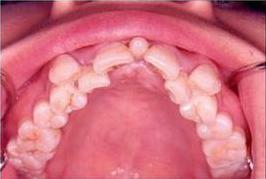 This is often a cause for orthodontic problems. The delayed eruption can be a result of many factors (local and general) – endocrine problems like hypothyroidism, extra teeth, odontoma, crowding of teeth, sclerosis of the soft tissues that cover the teeth and many more. In order to facilitate eruption the dentist should use orthodontic and surgical techniques. That may include creating a flap and removing the bone over the tooth in order to expose the impacted or supernumerary tooth. In this way it will be easy for the dentist to execute the dental procedure. If there are extra teeth, deciduous teeth or odontoma they need to be removed. When a big part of the crown is exposed orthodontic brackets can be bonded to the crown, and thetooth can be gradually aligned in its correct position in the dental arch. When the teeth are not erupted and are covered by soft tissue scalpel or electrosurgical blade is used for exposing the crown. This “window” helps it to erupt naturally. 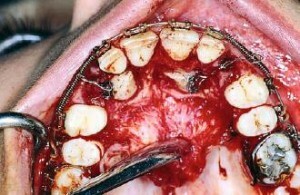 If that does not happen soon orthodontic treatment is needed. Sometimes people believe they have supernumerary teeth but the problem actually consists of late eruption of the permanent teeth. In order to help the permanent teeth to erupt a palatal flap is created and a round bur is used to remove the bone covering the impacted teeth. 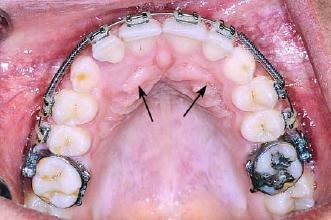 Brackets are placed – they will help the traction of the teeth in their right position in the dental arch. The presence of ectopic impacted teeth is not often observed. They can be at several places – near the mandibular angle, under the permanent teeth, in the mandibular ramus, in the coronoid process, in the maxillary tuberosity, in the walls of the maxillary sinus, nasal cavity and orbit. The treatment of these teeth is often complicated, especially when it comes to extraction and orthodontic treatment of supernumerary wisdom teeth. They are usually spotted on the x-rays but sometimes can cause a slight protuberance on the vestibular, lingual or palatal surface. This entry was posted in Supernumerary Teeth, Supernumerary Teeth Facts, Treatment of Supernumerary Teeth on August 3, 2012 by admin.